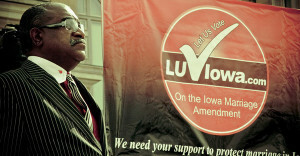 A prominent leader of the NAACP has resigned over the organization’s recent vote in favor of homosexual marriage. Pastor Keith Ratliff of the Maple Street Baptist Church in Des Moines, Iowa and president of the Iowa/Nebraska NAACP conference, recently issued a statement outlining that he was stepping down due to his disagreement on the issue. “I want to thank the NAACP for the privilege to humbly serve in such an organization and thank all those I had the privilege to work with in the states of Iowa, Nebraska and throughout the country,” said the 2003 inductee into the Iowa African American Hall of Fame. Ratliff had told the Des Moines Register after the NAACP voted last month to declare homosexual “marriage” as being a “civil right” that he was praying about whether he would continue with the group. Out of the over 60 members that attended the NAACP meeting in Miami, Ratliff was one of two individuals who refused to vote in favor of the declaration. “It’s about time someone associated with the NAACP has a backbone,” said Pastor Ken Hutcherson from Washington. Ratliff’s resignation includes both his position as local chapter president and as a member of the national board.